Before the CIS Championships kick off today in Edmonton, Alberta, there was some hardware to be handed out and one piece is coming back to Ottawa. Gee-Gee middle distance standout Emma Galbraith has been named the top rookie in the nation for her performances at 600m, 1000m, and 1500m this season. Emma beat out fellow 600m runner, Jenna Westaway of the University of Calgary, long jumper Sarah Taplin of Dalhousie University, and triple jumper Audrey Bonneau of l’Université de Sherbrooke to claim the award. The Franco-Ouest graduate’s season so far has been highlighted by record breaking performances, including setting a new Canadian Junior Record in the 1000m at the New Balance Collegiate Invite in New York City last month. In addition to her national standard, she has also rewrote the University of Ottawa record books, establishing new records at 1000m, 1500m and in the mile for the Gee-Gees. 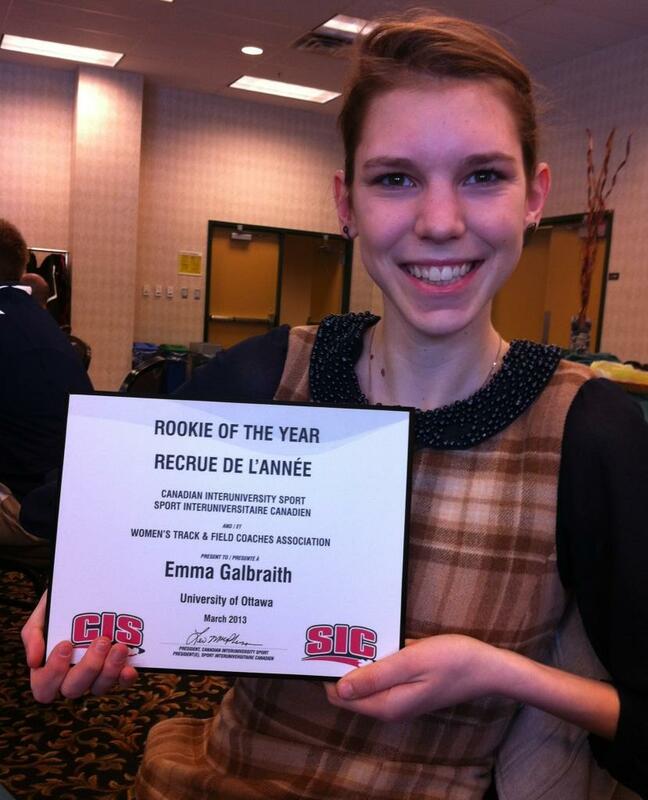 Emma is the first Gee-Gee to ever win a national rookie of the year award in track and field. Hurdler Ashlea Maddex was previously nominated for the same award in 2011. Galbraith is also only the second University of Ottawa student to recognized by the CIS following long jumper Christopher Greenaway’s Field Event MVP award in 2010.